Our Winter Solstice Share will give you an opportunity to celebrate the shortest day and the longest night of the year with plenty of nutritional, flavorful sustenance for only $100. Online registrations need to be finalized by Dec. 12, so we have time to harvest and organize your shares in time for the Solstice CSA Distribution Day on Saturday, December 15. You will have 3 Pick Up options: The Washtenaw Food Hub (4175 Whitmore Lake Rd., Ann Arbor) from 9 AM until Noon, Tantre Farm (2510 Hayes Rd., Chelsea) from 2 until 5 PM, or Argus Farm Stop (1200 Packard, Ann Arbor) from 8 AM until 6 PM. 1. Credit card payments (online transaction, so you pay a small 3% fee in addition to the $95)–If you are splitting a share, please make only one credit card payment. 2. Check payments FOR $100 (no online fee)– If you would like to use a check, you will receive an invoice response in your email after registering. 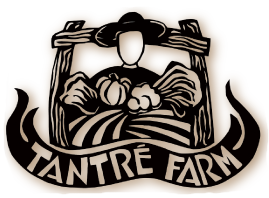 Within a few days of registration, please send a check (or checks, if you are splitting a share) written out to “Tantre Farm” to our mailing address for the balance due listed on the invoice. IF YOU ARE SPLITTING A SHARE, PLEASE INCLUDE BOTH CHECKS IN THE SAME ENVELOPE. This share honors the celebration of the shortest day and longest night of the year and the beginning of the countdown for summer! We are offering the best from our root cellar for roasting, salads, and soups, including carrots (purple, red, and orange), potatoes (blue, yellow, red, and fingerlings), Daikon radishes, watermelon radishes, beets, kohlrabi, several kinds of winter squash, pie pumpkins, onions, kale, and Brussels sprouts. As a special addition, we are collaborating with other local food artisans and farmers to round out the share with a bag of tender, pea or sunflower shoots from Garden Works Organic Farm, a loaf of locally-made, artisan bread, a jar of tasty lacto-fermented surprises from The Brinery (www.thebrinery.com), a savory, vegetarian, prepared food dish from Harvest Kitchen (www.harvest-kitchen.com), and organic apples from Mana Farms. The Solstice Share is an idea that has sprung forth as we head toward these shorter days and longer nights of the year. This is our way of celebrating the true end of the year’s harvest. This is a share that will sustain your winter hunger and cleanse the indulgent palette! “SOLSTICE CSA SHARE” registration is now open for 2018.